You can find a large collection of lovely private summer cottage or holiday homes along the east coast of Falster with wonderful bathing beaches with the blue flag and fresh and clean water from the Baltic Sea. You find the most charming places with summer cottages in Marielys and Bøtø direct to the several kilometers long wonderful beach and The Baltic Sea. Here you can find a nice summer cottage for use all year round and with sea view for any pocket and taste among the large collection of cottages. Other holiday areas on Falster are Hesnæs and Elkenøre. Most south is the harbour town Gedser situated. All those places are a good starting point for a trip to Germany. From Gedser you can take the ferry to visite the old Eastgermany town Rostock. On the modern ferries from Gedser you can have a nice time and get some good shopping in the tax free shop. The main town on Falster is Nøkøbing Falster, where you will find a modern town with most facilities and restaurants. Møn is a small very nice island north of Falster. Møn is a rural area with Møns Klint as a big attraction and well known for its beauty and grand cliff of chalk. You will never get tired of that place with the white chalk and green woods on the top! On Møn you can find holiday homes in Stege, Råbylille and other places, mostly in refurbished old houses. Between Møn and Falster is the very small island Bogø with and old village. Falster and Møn is a wonderful place for a golf weekend or summer vacation for the whole family. 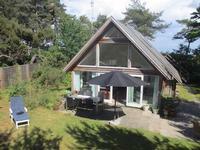 We wish you a very nice holiday in a private, cosy holiday home in Denmark - maybe on Falster and Møn! See more cottages on Falster - find them by searching in the seach form above.